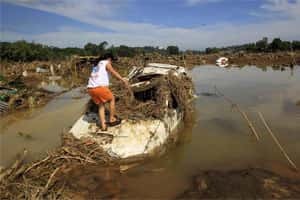 Cagayan De Oro, Philippines: Rescuers searched for more than 800 people missing in the southern Philippines on Sunday after flash floods and landslides swept houses into rivers and out to sea, killing more than 650 people in areas ill-prepared to cope with storms. “Our office was swamped with hundreds of requests to help find their missing parents, children and relatives," Gwendolyn Pang, secretary-general of the PNRC, told reporters. “We’re helping coordinate the search with local government, army, police and even other aid agencies." “This is the first time this has happened in our city," Vicente Emano, mayor of Cagayan de Oro, said in a radio interview. He said officials in the area did not receive adequate warning before the typhoon struck. “I saw for myself bloated bodies of women and children, not less than 100," vice president Jejomar Binay told Philippines radio as he toured the worst hit areas in Cagayan de Oro. “We need body bags and lime to deal with too many cadavers," Amarille said, fearing an outbreak of disease. “Local mortuaries are no longer accepting cadavers and they are even asking people to bury the dead at once because there are too many bodies even in hallways," he said. Most of the fatalities were from a slum area on an island sandwiched by two rivers in Iligan. “About 70% of the houses on the island were washed into the sea," Amarille said. “This poses challenges to us ... We need to educate people with this kind of change in climate," Pang said. “The volume of rainfall for one month fell in just one day." Carmelita Pulosan, 42, said she and eight family members and neighbours survived by sitting on top of the tin roof of their house as it drifted miles into the open sea after floodwater swept through their village. “There was a deafening sound followed by a rush of water. We found ourselves in the river and the current took us out to the sea," Pulosan, from Cagayan de Oro, told Reuters. “The current was very strong. God is really good to us. He saved my family," she said. Only one 3-storey building was left standing in their village, Pulosan said. US secretary of state Hillary Clinton said the United States, a major ally of the Philippines, was ready to help. The Chinese embassy would donate $10,000 to help in the relief efforts, an embassy official said.